Will Blake be jailed for a murder he believed was just part of a good story? And what will his fiancée make of this? From the author of A Ticket for Perpetual Locomotion, this story will dazzle adventurers and armchair detectives alike. 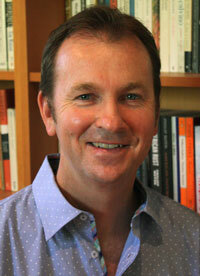 Geoffrey Gates was born in Sydney, where he lives with his family. He is the author of IP Picks 2005 Best Fiction winner A Ticket for Perpetual Locomotion, as well as short stories published in a range of literary journals such as Southerly, LINQ, UQ Vanguard and Verandah. Geoffrey teaches English and creative writing to senior school students, and has worked as a teacher in Australia, England and Germany. He has spent many months in the Provence and Drome regions of France where he drew inspiration as the setting for The Copyart Murders, his second novel. It is, sometimes, the case that crime stories end before they quite get going. We work them out half-way through and will only read the second half to confirm what we already know. 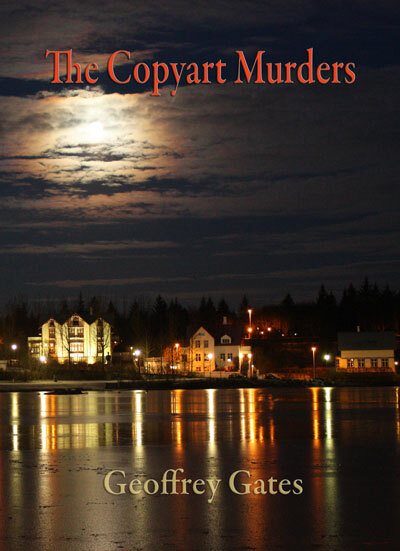 The crime is the hook and the exciting murder/drama should begin at the beginning of the book and like any good affair, keep us on our toes till the final line. And location, location, location – the more ordinary the setting the more shocking the crime – when a pair of tramps fight a territorial battle in the foyer of a five-star hotel, we sit up. These are the challenges asked of Australian author, Geoffrey Gates, who sets his crime novel in a village in the south of France. Blake Knox, like many young Australian English teachers, heads for London with the bones of writing in his head – but only the bones. The author takes us into the uncertain world of a London classroom where he portrays Blake as a positive if somewhat immature young man from Sydney. He, naturally, has to fall in love and does so with the beautiful, privileged Elizabeth – to his surprise, she falls for him. He hasn’t written a line but introduces himself as a writer. She is suitably impressed to the extent that she gets engaged to him, supports his dream and encourages him to take his talent to a village, Piegon, in the south of France. We have a perfect setting. The novel begins, here, when the would-be author finds himself being woken, by a policeman, on a gravestone slab after a night of alcoholic indulgence during which he, somehow, suffers a blow to his head. This might not have been all that dramatic, except for the fact that the name on the headstone was that of the artist, Genet, who’d, recently, been murdered. Blake’s difficulties are compounded by his involvement with the beautiful language student, Birna, from Iceland, as well as the discovery that the murder in his crime-story manuscript is a carbon copy of the method used to murder Genet. How could he not have done it? As is usual, a good deal of questioning ensues and Blake’s situation become more precarious. The truth of his involvement with Birna and his blueprint for murder would seem to portray a very fragile, volatile personality. He is, naturally, gutted: publicly humiliated and exposed as an unfaithful cheat in the presence of the loyal Elizabeth and his overwhelmed parents. Days must seem eternities to a confused teacher with aspiration to be a writer, incarcerated in a foreign land without language; in a different legal system facing an inevitable conviction and sentence – a seemingly hopeless situation. Geoffrey Gates has a beautiful writing style employing prose and dialogue to convey facts and information while, at the same time, holding our attention as the story thunders along. The reader is never ahead of the action. My only reason for reading some sentences more than once was to admire the distinctive style and mastery of language everywhere in evidence. The characters are compelling. Inspecteur Sauveur is a gentleman, at all times, with an assistant of limited intelligence and big muscles. We feel for and with Blake in his seemingly hopeless situation and process of maturation. The young women in the story are lovely. The novel is not without its sad moments but it is, above all, hugely exciting – a great read. On the morning of his arrest, Blake Knox was asleep on a marble gravestone in the cemetery of Vaison-la-Romaine in the South of France. He lay on his side with his legs tucked in so that his feet did not stick out over the end. It was a French cemetery and he was a long Australian. Where he lay was a pleasant place, surrounded by purple orchids and yellow poppies and shaded by a cypress pine. Not that Blake had any wish to be aware of his surroundings. He was dreaming of Birna. They were in a rowboat together; she was lying back in his arms and they were looking up at a cloudless sky. He was trying to explain to her a complication in his novel. The sun was in his eyes and he couldn’t quite make out her face, but her shirt was open and he glimpsed a black, lacy bra, and soon he felt the warmth of her body beside his. He reached out, groaning like a corpse exhaling a belated breath. It was this noise that attracted the attention of a passer-by. Had Blake’s dream been less promising, he might have lain undisturbed a little longer. With the increasing sounds of day, he’d have woken, made his way to his car and driven to the café in Piégon. Louis would have told Blake the rumour concerning Genet’s death, giving him time to prepare for the coming investigation. Certain incriminating files might have disappeared from his laptop; pertinent alterations made to his manuscripts. But Blake slept through this small window of opportunity as his little scene continued. He was unclasping Birna’s bra when he might have been undoing the cemetery gate. He felt a sudden jolt, as if the rowboat was being dragged under the formerly gentle waves. White water poured in; he experienced a terrifying sensation of tipping into deep water, green as Sydney Harbour. Blake opened his eyes. A stocky man was kneeling beside him. He was closely shaven and wore a navy-blue suit. There was a concerned look on his face and Blake heard a rush of incomprehensible words. ‘Are you hurt?’ the man asked. Blake had no time to turn and read the inscription, an action that might have made the next few hours more comprehensible to him. Instead he was dragged out of the cemetery and onto the road. He felt too ill to protest with any real conviction (‘Hey, what’s this?’ proved ineffective) or put up any sort of struggle against the man who was obviously much stronger than he was and who had a tight grip on his arm. Down the hill they marched. He pointed at his car as they passed and murmured: ‘All this for a parking fine?’ Further on, outside the bakery, he felt his stomach lurch and he heaved into the gutter, spilling vomit onto the policeman’s polished shoes. ‘Merde!’ the man spat in disgust, temporarily letting go of Blake’s arm to wipe his shoes with a tissue he had produced from his inside coat pocket. There was no reply and Blake was assisted inside and led over to a counter where a uniformed officer was stationed. The man’s eyes seemed to open wider with this information. He spoke a few hushed words to the seated policeman and then hurried down a corridor to the left. Blake thought, I wonder what can be the matter? He felt the back of his head and his hand touched hair matted with blood; the same colour as the stain on the jacket that had served as his pillow. He tried to remember what had caused his injury. He vaguely recalled stumbling on the way to his car the night before. Perhaps they think I have been mugged, he reasoned, turning hopefully to the desk sergeant. From somewhere, a second uniformed officer had appeared and stood behind him. He began to feel hemmed in. When he didn’t react, the man repeated his instruction. Only then did Blake reach into his pockets and hand over his wallet, his keys, and the little black notebook he always carried with him. It was for scribbling ideas for his novel. He would have had a few things to add right now, given the chance. He watched the policeman count out his euros, record the details of his credit cards and his New South Wales driver’s licence, and lastly, hold up a photograph, which he studied carefully before putting it under Blake’s nose. Blake stared at the photo, confused. Instead of the one he kept of his fiancée, Elizabeth, with her boyish haircut, her sharp eyes and wry smile – what he saw was a rather sultry-looking image of Birna. She was staring provocatively into the camera eye, her blonde hair dishevelled and teased up in a retro-punk style. ‘Umm… a friend,’ he said in a tone that sounded like a question. The policeman put his things into a plastic bag and asked Blake to sign a form to say that these were his possessions. Then the stocky policemen led him down a corridor. A door opened and suddenly Blake was looking into a cell, bare except for a hard wooden bench. He felt a shove in his back and he stumbled forward. The door shut behind him with a clang. He smelt urine and dried vomit. It was worse than the toilet block at the annual Christmas party back in his old days at the Copacabana Surf Club on the New South Wales coast. These days, Police Inspecteur Roland Sauveur took his summer vacation reluctantly. Experience had taught him to avoid hotel rooms and vacation resorts, where he would inevitably be surrounded by noisy families and happy couples (or worse, by happy families and noisy couples). Last year, he had bought a 28 foot gaff cutter, a wooden yacht with a light and narrow hull, so he could take to the sea. It was a beautiful boat. Finally, he had arranged for some leave from work: he was to spend two weeks on his own, sailing the Côte d’Azur. Then he had met Karin and she had offered to be his first mate (or he had asked, he really couldn’t remember). She was a doctor, intelligent and good-looking. She was also a recent divorcée with a fifteen year-old son, whose face wore a permanent smirk. In the end, they had agreed on perhaps two nights, depending on her sea legs and professional commitments. But it wasn’t easy for Sauveur. Sometimes he felt desperate for romance to blossom again. But then he remembered his wife. A black mood would descend and he would feel that it was all quite impossible. He was better in the daylight hours; he liked the routines and camaraderie of work. It didn’t matter if the task at hand was banal or dramatic; he was a policeman with his place in the world. He had left Vaison-la-Romaine mid-week, had sailed out to sea each morning and returned to Cassis by twilight. In the evenings he cooked, read and relaxed. As his break entered its second week and the time for Karin to come on board approached, he felt an increasing nervousness. Finally it was Friday morning and she arrived, impractical in a short blue dress. Sauveur lifted her overnight bag on-board and showed her the little cabin. New bed linen and towels, along with the quality of the wood, drew an approving smile. They drank a glass of champagne before he started the outboard motor and steered them out of the harbour. She felt ill almost straight away, although the sea was calm. While the earlier banter soon disappeared, the pureness of the day meant that he didn’t worry too much. But she was unable to eat the seafood dinner he prepared in the evening, and by nightfall, there was none of the romance that Sauveur had anticipated and all of the cramp of a small boat. They spent a sleepless night, physically distant. In the early morning she told him that it wasn’t his fault but she preferred to head back to land. Sauveur said that he understood and rigged the sail. Before getting off the boat, she’d said ‘Thank you, Roland.’ Then she’d walked all the way along the jetty without turning back to wave. Their trip together had lasted fewer than twelve hours. ‘Quelle déception!’ he said aloud, tipping the remains of last night’s uneaten oysters overboard. Then, as if calling him back from another world, his mobile phone came to life and he listened to a voice message from his assistant, Agent Benjamin Flague, wishing not to interrupt his holiday but asking if he could call him back at his convenience. Sauveur knew what it would be about: the sudden death of a celebrated local artist, Michel Genet. A young Icelander named Birna Aronsdóttir had found the body. She saw him lying on the smooth tiled floor beside the coffee table by the entrance to his study, still as the comfortable lounge that surrounded him on either side. After checking his pulse and finding none, Birna had telephoned the ambulance as well as the police. Benjamin had been alerted and had arrived to find Birna sitting on a chair outside the house. At first, she had seemed calm but when asked what had happened, she had sobbed and then sat very quietly, seemingly unable to answer Benjamin’s quite straightforward questions. He had told her that they would speak later and asked her if one of the uniformed officers could drive her home. A medical officer had just completed his examination when Benjamin entered the house. A sweet, putrid odour rose from the body of a grey-haired man, stretched out on his back. He was middle-aged, dressed in light trousers and a pressed long-sleeved white shirt, which was unbuttoned to reveal a mass of grey chest hair and a gold cross hanging from a chain around his neck. His face was expressionless, neither surprised nor anguished. The ambulance officers had laid out a stretcher and were standing by, ready to remove the body when requested. ‘What does it look like?’ asked Benjamin. Benjamin followed the light to the back of the mouth, where the tongue and the throat were spotted black. Sauveur flipped open his phone and dialled Benjamin’s number. ‘Who is he?’ Sauveur asked. As he started his car, Sauveur thought that there was always something so disappointing about holidays: the failed realisation of longed-for happiness.